Every week of the year has its own Torah portion (a reading from the first five books of the Bible) and its own haftarah (an accompanying reading from the books of the prophets). This week the Torah portion is Pekudei (Exodus 35:1-40:38). The haftarah in the Sefardi tradition is 1 Kings 7:40-50; the haftarah in the Ashkenazi tradition is 1 Kings 7:51-8:21. Moses assembles the first roofed structure for the God of Israel at the end of the book of Exodus, in this week’s Torah portion, Pekudei. It is a small tent: 10 by 30 cubits (about 15 by 45 feet or 4½ by 13½ meters). 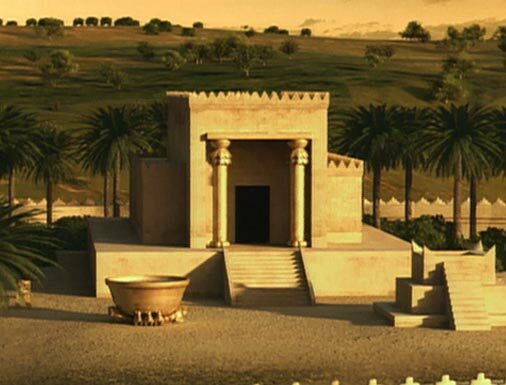 Both options for this week’s haftarah are about the temple King Solomon builds in Jerusalem. A tall building of stone and cedar, its footprint is 20 by 60 cubits (about 30 by 90 feet or 9 by 27 meters). Solomon’s temple is four times as big as Moses’ tent sanctuary—and it needs to be. As the main temple in the capital of a nation-state, it must accommodate many priests. The tent sanctuary has to be disassembled and reassembled whenever the Israelites move to a new camp in the wilderness, and only Moses, Aaron, and Aaron’s sons go inside. Like most religions in the ancient Near East, the religion outlined in the Hebrew Bible makes a distinction between public worship and the rituals conducted by priests. The public place of worship is the open courtyard in front of the sanctuary, where animals and grain products are offered at the altar. Only priests are allowed to go inside the tent or temple. Ohel Mo-eid (אֹהֶל מוֹעֵד) = Tent of Meeting. From ohel (אֹהֶל) = tent and mo-eid (מוֹעֵד) = meeting, meeting place, appointed time or place. The courtyard in front of Solomon’s much bigger temple has a huge bronze “sea” resting on twelve bronze oxen. (See last week’s post, Haftarah for Vayakheil: Symbolic Impressions.) In addition to this much more impressive basin, Solomon’s master artisan makes ten smaller bronze basins on elaborate wheeled stands covered with engraved spirals, cherubim/keruvim, lions, and palm trees. bayit (בָּיִת) = house, important building, household. Why settle for one small basin when you could have a giant “sea” and ten basins? Both Moses’ sanctuary and Solomon’s temple are divided into two rooms: a main hall and a smaller chamber in back for the holy of holies. King Solomon adds a front porch with two gigantic bronze columns. The main room of Moses’ sanctuary contains only three sacred ritual objects: a gold incense altar, a gold-plated table for display bread, and a solid gold lampstand with seven oil lamps. The main hall of Solomon’s temple has the same three items, also gold—but the lampstands and perhaps the tables have multiplied. Instead of placing one lampstand on the right side of the main hall, King Solomon’s crew positions five lampstands on each side. In the first book of Kings, Solomon’s temple contains only one bread table. But by the fourth century B.C.E., when the two books of Chronicles were written, the bread table had multiplied. After all, if one table is good, ten tables must be better. Since the ark is only about four feet long, a keruv wing cannot be more than two feet long. But in Solomon’s temple, each keruv is about fifteen feet tall and has a fifteen-foot wingspan. 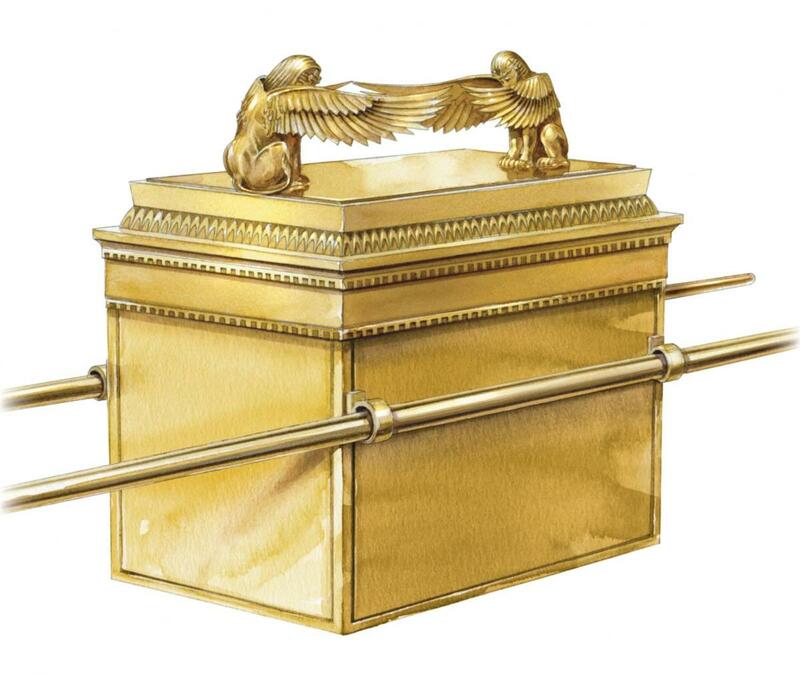 An earlier passage in the first book of Kings describes how they are carved out of olive wood and overlaid with gold, then set up in the back chamber so that each one touches a wall with one wingtip and the tip of the other keruv’s wing with the other. Since the ark is smaller than these statues, it fits underneath them. It is not clear whether the inner chamber of the temple now contains four keruvim—the small pair on the ark and the large pair standing on the floor—or just the two large ones. But either way, the principle of “more, bigger, better” applies even inside the holy of holies. When it comes to religious ritual objects, is more or bigger really better? Anything made of precious metals would have provided a locus for worship that met the expectations of the Israelites Moses led through the wilderness. In Exodus, thanks to the tent sanctuary and its ritual objects, they no longer feel the need for a golden calf. And if the ritual objects were too large or too many, they would be too hard to transport through the wilderness. The capital of a new nation-state, however, needs not only a large and permanent temple, but also a large and glittering display to impress both foreign visitors and the nation’s citizens with the power of its religion. So in front of King Solomon’s temple are gigantic bronze columns, the oversized bronze “sea” on twelve bronze oxen, ten bronze lavers on elaborate stands, and a host of priests walking in and out of the building. Inside, there are enough lampstands and tables to accommodate those priests as they perform the rituals, which would help reconcile them to a centralized religion. In my own life, I have responded to religious cues on both scales, small and large. I know the calm, centering effect of lighting two candles for Shabbat, and the hushed tenderness of reading from a Torah scroll in an otherwise unremarkable room. I also know the awe I feel when I stand at the ocean, in a forest of tall trees, or in a medieval cathedral (even though as a Jew, I am a foreign visitor there). I do not want to lose either the personal connection of rituals with small sacred things, or the impersonal awe of encounters with vastness. Both a tent and a temple are exalted places where God might rest. Canaanite temples were built according to a basic three-part plan: a courtyard in front, a main hall behind it, and a small sacred chamber at the back containing a statue of the temple’s god. There were often additional rooms at the sides of the main hall for practical use by the temple’s priests and functionaries, but religious rituals happened in the courtyard, main hall, and back chamber. During the course of the Hebrew Bible, the Israelites construct three sanctuaries. The portable Tent of Meeting that Moses assembles at the end of the book of Exodus travels with the people from Mount Sinai all the way across the Jordan River. It is erected in several locations while the Israelites are gradually conquering Canaan: Gilgal, Shiloh, Nob, Givon, and then Jerusalem. King Solomon builds the first temple in Jerusalem in the first book of Kings, and the construction of the second temple in Jerusalem begins in the book of Ezra. All three of these sanctuaries follow the basic three-part Canaanite plan. But since the Israelites are forbidden to make an image of God, the innermost chamber at the back cannot contain a statue of their deity. So what is inside the “holy of holies”? This week’s Torah portion, Pekudei (“Inventories”), says what Moses put into the holy of holies in the Tent of Meeting. What are the wings of the keruvim on the cover screening off? The space above the golden lid is empty—or, at least, nothing is visible there. But the Torah treats the aron as a throne for an invisible, although not inaudible, god. The keruvim and the lid of the aron are a single piece of gold in the Tent of Meeting. But in the first temple, they are separate items. While the aron stays in the tent where King David put it, King Solomon’s craftsmen make two keruvim out of olive-wood overlaid with gold. Each keruv is ten cubits (about 15 feet) tall, with a ten-cubit span from wingtip to wingtip. The haftarah reading corresponding to the Torah portion Pekudei is from the first book of Kings. It describes the ceremony after the first temple in Jerusalem is completed, starting with a procession as King Solomon and elders from all over Israel accompany the aron on its short journey from the tent in the old city to the new House of God. 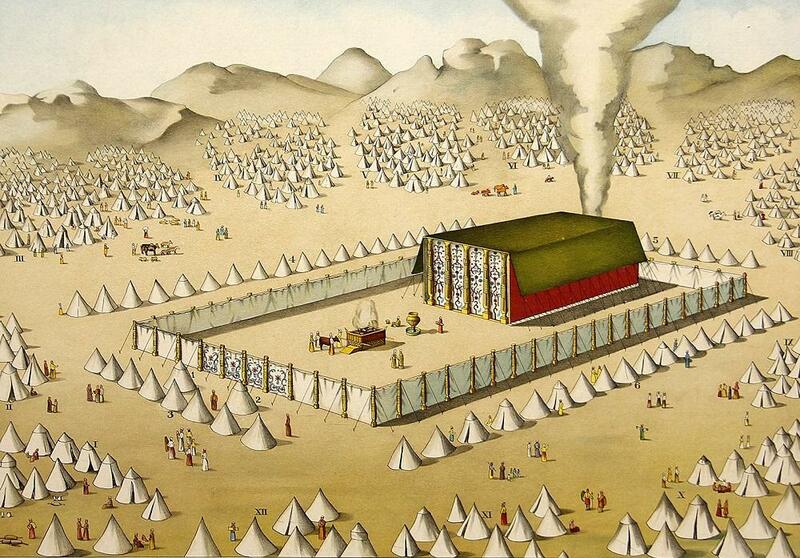 In both the Tent of Meeting and the first temple, there is an empty space between the lid of the aron below and the wings of the keruvim above. God’s voice or presence is never located inside the aron, only in the space above it. Yet inside the aron is the eidut, God’s testimony. Commentary on the Tent of Meeting agrees that the eidut means the second, unbroken, pair of stone tablets inscribed by God on Mount Sinai (also called Choreiv). Commentators disagree on whether the aron also contained the shattered tablets, and/or a scroll that Moses wrote. The first temple was sacked several times, and when the Babylonian army captured Jerusalem in 586 B.C.E. they razed it altogether. The keruvim and the aron were never recovered. So in the second temple, which was begun in 538 B.C.E., the holy of holies was an empty room. But priests still treated it as the locus of God’s presence. After the Romans destroyed the second temple in 70 C.E., Jews had to find God’s presence in other places. Today, many of us search for God by going inside ourselves: pondering what we have learned, questioning our feelings, meditating, sinking into ritual, praying with intention, and so on. This inner journey in search of God also has stages. If the first stage of your search is like the courtyard of the Tent or temple, does your courtyard have an altar for animal sacrifices and a basin for washing? 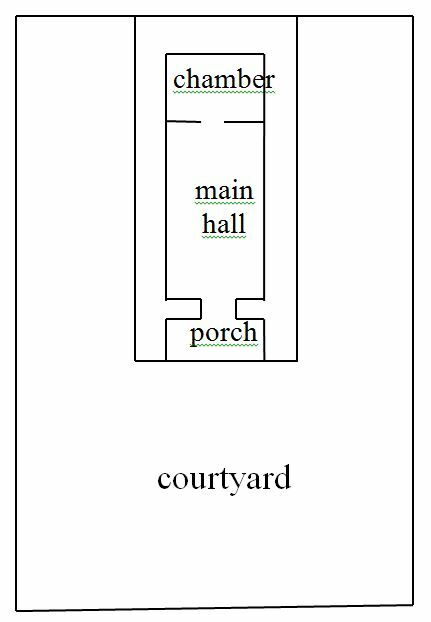 If you push on into the main hall, does it have any of the furnishings of the Israelite sanctuaries: a lampstand for light, or a table for bread, or an altar for incense? And if you keep searching even deeper, what do you find in your holy of holies? Do you enshrine fundamental written principles in a gold coffer? Or do you encounter fantastical creatures? If you find both in your holy of holies, are the fantastical creatures bigger or smaller than the coffer? Or is your holy of holies an empty room? The book of Exodus/Shemot ends this week with a double portion, Vayakheil (And he assembled) and Pekudei (Inventories). The Israelites eagerly donate materials for the mishkan (the portable dwelling-place for God), and for ritual garments for the new priests. They make all the parts of the mishkan, and Moses assembles them. At the end of the book, God’s glory enters the Dwelling. In Vayakheil, the community of witnesses is also the community that donates and makes the mishkan. Women as well as men are specifically included in this group. 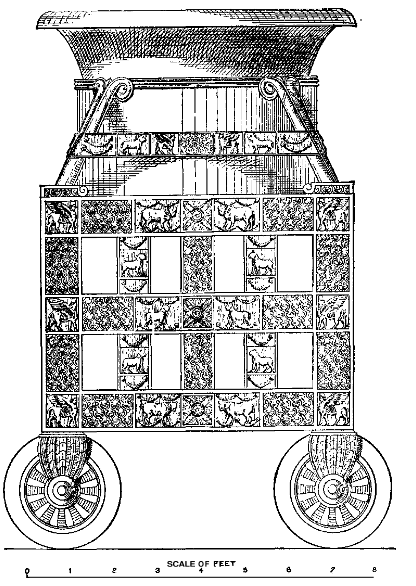 In Pekudei, when Moses assembles all the parts of the mishkan, he puts God’s testimony, ha-eidut, into the ark, then inserts the carrying-poles into the rings at its corners, and puts the golden cover on as a lid. The Torah does not specify what the testimony inside the ark actually is. Classic commentary is divided on whether it consists of a parchment scroll on which Moses wrote down the first part of the Torah, or the stone tablets inscribed by the finger of God with the commandments (both the intact pair of tablets and the shards of the broken pair), or both the scroll and the tablets. Either way, The Testimony is something the Israelites already have. And Moses has already told the people that God is with them. But seeing is believing. The Israelites need to witness Moses putting God’s “testimony” into the ark, and then they need to witness God’s visible presence. On their journey from Egypt to Mount Sinai, they followed a manifestation of God as a pillar of cloud by day and fire by night. But the pillar disappeared when they arrived at the mountain, and clouds of smoke and fire appeared only at the mountain’s peak. This was not enough for the Israelites; when Moses was gone too long, they made a golden calf. And soon they will have to leave Mount Sinai and journey on to the Promised Land. How can they know God is really with them, and God’s testimony is really secure? Their memories of God’s miracles in Egypt and manifestations after that are not sufficient. The Israelites are like witnesses with poor recall. In order to remain fully aware of God’s presence and God’s investment in them, they have to build a visible, tangible place for God to dwell, and then they have to witness something that indicates God’s presence in that dwelling-place. Only then can they fend off their fear of abandonment. Today, our world has many sanctuaries designed to make people feel the presence of God, including many synagogues, cathedrals, and mosques. (We also have a plethora of buildings intended for religious worship whose architecture is no more inspiring than a high school gymnasium—but that’s another story.) Many religions also have fixed prayers or mantras, with words to be recited or sung at specific times, words designed to help people feel the presence of God. Nevertheless, God’s presence is not concrete enough for most humans today to attest to it as witnesses. And most thoughtful people know that any written “testimony” we have, however accurately copied, was written down by fallible human beings, and that means that, at best, something was lost in translation. We have no ark, we have no mishkan. We know that if we discovered the ark, buried away somewhere, and attempted to duplicate the mishkan described in the Torah, God would not manifest in it the same way. We live in another time, millennia away from the ancient peoples who built the Dwelling for God on their journey across the wilderness. Yet so many people, including myself, yearn for something ineffable, something so hard to name that we call it “God”. Some find an anthropomorphic idea of God helpful. Some find the idea of a being who is omniscient, omnipotent, and omni-benevolent helpful. I am one of those who use the words “God” and “soul” when we want shorthand ways to talk about the mysterious feeling that there is some huge extra meaning in the universe and in ourselves. No matter what phenomena I observe, I can always generate counter-explanations that prevent me from being a witness for “God”, whatever that word means. Nevertheless, I have discovered that I can help my sense of a divine presence to grow. I can build an imaginary mishkan inside my mind, and witness some spirit of the divine, in the form of mystery and exaltation, obscurity and light … cloud and fire. May we all discover some of the divinity that dwells inside us. The last Torah portion in the book of Exodus/Shemot, Pekudei (“Inventories” or “Commissions” or even “Searches”) lists once again all the items made for the sanctuary and the priests’ garments, this time including the weight of the donated gold, silver, and bronze. Moses assembles all the parts, and then God’s cloud appears and fills the new Tent of Meeting. The portable dwelling-place for God is complete. Its front half is a roofless courtyard surrounded by curtains, and contains the altar where slaughtered animals and grain are burned. The back half is the new Tent of Meeting, which is both curtained and roofed, and contains the holiest objects: the gold incense altar, the gold-covered bread table, the solid gold lamp-stand, and the gold-covered ark inside its own curtained alcove. Only priests, and Moses, can enter the Tent of Meeting. The wash-basin in front of the entrance to the Tent is critical for the transition between the public courtyard and the inner sanctum. Washing in water symbolizes inner purification, the mental preparation necessary to enter a space where there will be closer communion with God. In the Torah, hands stand for action and power. By washing their hands, Moses and the priests dedicate their power and actions to divine service. Feet are related to one’s path in life, the direction one is going psychologically as well as physically; the greatest men in the Torah are described as “walking with God”. By washing their feet, Moses and the priests rededicate themselves to walking with God. nechoshet = bronze, copper. From the same root as nachash= snake; and nicheish = practice divination, seek omens. The unusual donation of mirrors led to a story in Midrash Tanchuma, a 5th-century commentary, that when the Israelites were slaves in Egypt, the women used mirrors to entice their husbands into lying with them and producing more children. Moses hesitated to make a holy object out of mirrors, which are instruments of vanity. But God overruled him on the grounds that the women had used their mirrors for the good deed of multiplying the children of Israel. And the master-craftsman Betzaleil used the mirrors to make the wash-basin. This fanciful story was accepted by many subsequent commentators. But I think it is inconsistent with the descriptions in Exodus/Shemot of the Israelite slaves as poor and oppressed. Surely they could not afford anything as expensive as bronze mirrors! The only time in the book of Exodus when the Israelite women could acquire mirrors is the day before they leave Egypt, when Moses tells them to take gold and silver jewelry from the Egyptians. So why does the Torah say the wash-basin at the entrance of the Tent of Meeting is made out of bronze mirrors? It’s always possible that an odd detail in the Torah refers to some ancient practice that occurred outside the story, perhaps in the cult of another group of people. But what I notice is that a priest washing his hands and feet at the entrance of the Tent of Meeting would see a double reflection: a reflection on the surface of the water, and a reflection from the polished bronze basin. Samson Raphael Hirsch, a 19th-century rabbi, wrote that the language in this verse might mean the mirrors were not even melted down, but only welded together in a form where they could still be recognized. Perhaps the basin would even show a different reflection in the surface of each mirror. Furthermore, the basin was made by Betzaleil, whose name means “In the Shadow of God”. A shadow provides protection from the harsh sun of the Middle East, so some commentary notes that Betzaleil is under God’s protection. But a shadow is also a type of reflection; the original thing casts a shadow on the ground, just as the original thing casts a reflection in a mirror. The Hebrew word for shadow, tzeil, is the root of the word tzelem, which means “image”. 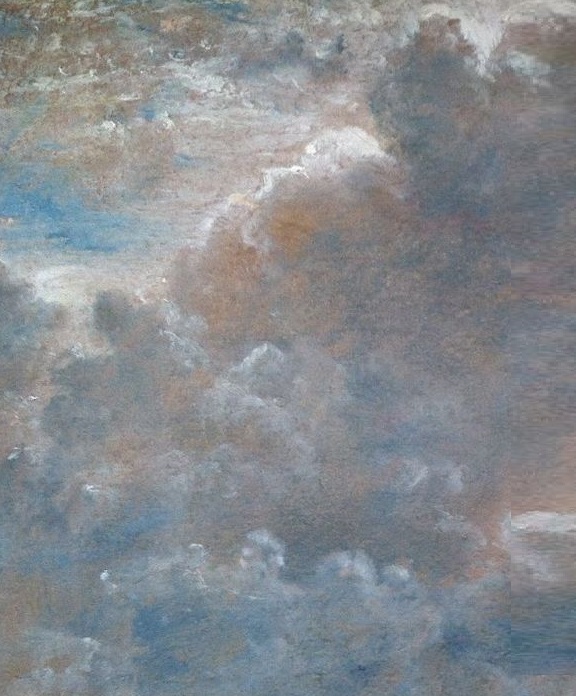 So when a priest steps up to the bronze basin, he sees multiple reflections of the sky and of his own body, and perhaps multiple reflections of the heavens, his own soul, and other aspects of God. After all, the basin was made by “In the Shadow of God”, and the word for “bronze” comes from the same root as “divination”. All of these reflections from the basin, besides reminding him that he is preparing to come closer to God, provide food for the priest’s inner reflections. Has he been using his body the right way? Has he been mired in harmful thoughts and emotions? Has he been acting like someone made betzelem elohim, in the image of God? After he has reflected, the water from the basin purifies him as he washes and rededicates himself to the path of holy service. We could all benefit from washing at a basin of mirrors before we pray, or meditate, or take a moment to reflect on our lives.